Yesterday I removed my gel nails *cries* so sorry for the shortness of my talons, I had to file them down as they had become weak under the gels. As Halloween is only 3 days away I thought I would paint my nails an appropriate pumpkin orange shade. 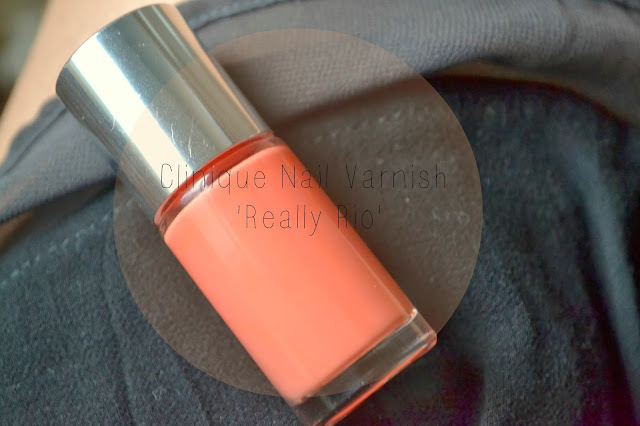 Clinique's 'Really Rio' is a gorgeous orange with a slight coral undertone to it, perfect to brighten up your nails on a dreary autumn day. I'm not one of those people that saves the bright shades for summer, in fact, I love to embrace the brightness in the winter as it adds a bit of colour and puts me in a really good mood. The nail varnish itself is extremely quick drying and leaves a lovely glossy finish. I applied two coats and my Sally Hanson topcoat and after two days wear they still look freshly painted wish is surprising as I'm a massive fidgeter and always play with my nails. So all in all its a pretty damn good nail varnish.